Field trails were conducted at Sakha Agricultural Research Station (El-Hamrawy farm), Kafr El-Sheikh governorate in salt affected soils. Growth cycle included rice and wheat. rice was applied for three successive seasons (2013-2013/2014 and 2014).The soil was treated with gypsum, mole drain, farmyard manure and biofertilizer combined with different sources of nitrogen (urea, ammonia gas and ammonium sulphate). The highest rates of salt leaching were achieved with the application of gypsum combined with the injection of ammonia gas followed by the application of gypsum plus urea or gypsum plus urea and biofertilizer. The soil sodicity decreased after three seasons with all treatments combined with different nitrogen sources. 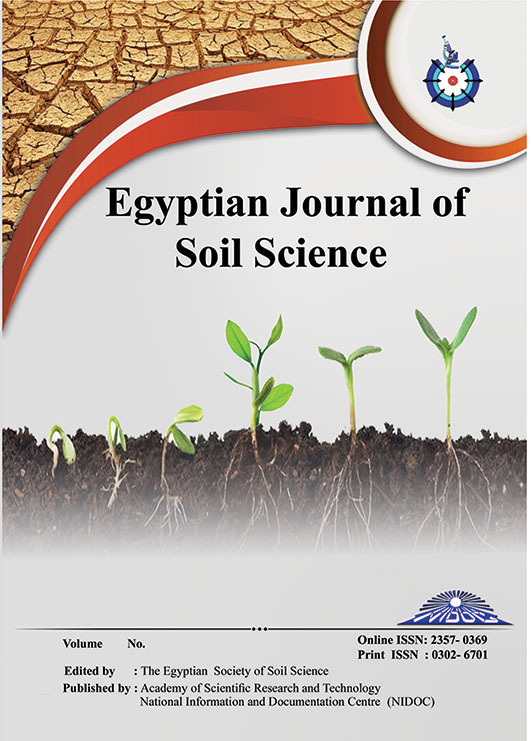 Application of gypsum combined with the construction of mole drain at 4 m spacing, ammonia gas, farmyard manure and biofertilizer had the highest value of infiltration rate at the end of the growth cycle compared with the values before starting the experiment, while the application of gypsum plus biofertilizer and urea produced the lowest infiltration rate. The bulk density and total porosity were positively affected by the application of gypsum, mole drain combined with ammonia gas, farmyard manure and biofertilizer. The application of gypsum plus farmyard manure and ammonia gas or mole drain at 4 m spacing combined with biofertilizer, farmyard manure and ammonia gas increased the yield and irrigation water use efficiency of rice and wheat.